Jamaican sugar planters sometimes struggled to get their produce back to England. Freight rates were often high, ships sometimes in short supply and of course they could be lost at sea. Along with a developing banking industry, the eighteenth century saw the growth of insurance, and new companies sprang up that would insure a cargo against loss. If you have London ancestors you may find them in the Sun Fire Office records, which are held at the Guildhall in London, and indexed on the National Archives online. Fire was, and is, an ever present risk and it was especially so for warehouses storing Jamaica’s main exports of sugar and rum which are both highly flammable. I remember stories in my childhood of how the bombing of the Tate and Lyle sugar refinery at Greenock in the second World War caused a fire that could be seen from many miles away. Two decades later a fire in a bonded whisky warehouse in Glasgow remains Britain’s worst peacetime fire services disaster. Wooden barrels stored on wooden racks in an old building with a high wood content burned furiously, and the vapourising alcohol caused an explosion that blew out the sides of the building and cast debris and barrels of flaming liquid onto the firefighters below. Both sugar and alcohol explode at high temperatures, scattering fiery material to start further fires. Such was the nature of two disastrous London fires in the eighteenth century. You may remember I wrote a while ago about Captain Stephen Blanket who sailed supply ships to Jamaica and ended his life with a comfortable fortune as a merchant, living in Princes Street Rotherhithe, which ran at right angles to the river Thames. There, shortly after his death, a kettle of molten pitch, used for caulking ships and other waterproofing jobs, boiled over and caught fire. The fire spread and destroyed over 200 buildings along the river front at Rotherhithe. The buildings would almost all have been built of wood, many old and dilapidated and many containing flammable materials arriving from abroad or waiting to be despatched. Such fires could be difficult to put out and were sometimes long lasting – after the Great Fire of London in 1666 materials smouldered in cellars for many months afterwards, bursting into flame again when air reached them. An even more disastrous fire happened at the end of the eighteenth century on the opposite side of the river at Ratcliff. In July 1794 another pitch kettle fire, at Cloves barge builder’s yard, ignited a cargo of saltpetre, an ingredient of gunpowder, in a riverside barge. This sent exploding fragments high in the air over a wide area and before it was finally put out the fire had destroyed 453 private houses, more than 20 warehouses and other large buildings and several ships on the river. The buildings destroyed included offices of the East India Company. Although largely forgotten now, it was London’s worst fire between the Great Fire of 1666 and the Blitz. Add these risks to the constant threat to merchants’ profits from the pilfering of their cargoes as they were unloaded on to smaller boats in the overcrowded river Thames and rowed ashore to be manually handled into storage, and you can understand the pressure for a new solution to London’s booming international trade. 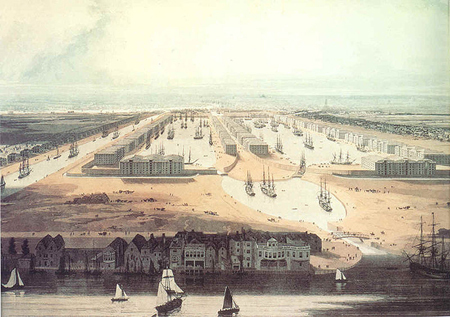 The need for new docks had been mooted for some time and in the end a large number were built on both sides of the river, but the most brilliant of these were the West India Docks which utilised a bend in the river at the Isle of Dogs to create an industrialised cargo handling system on a scale that had not been seen before. Ships coming up river entered the docks from Blackwall Reach, unloaded their cargoes directly into huge brick built warehouses and then left via Limehouse Reach having loaded a new cargo. The whole site was secured by a continuous high brick wall. This view of the proposed West India Docks and City Canal is by W. Daniell and was painted in 1802 when construction had already begun. It looks west towards the City of London. In fact the final layout of the docks was rather different, with three broad docks rather than two docks and a canal, and it was further modified later in the nineteenth century to make use of the new railway technology and steam powered cranes. A survey sponsored by English heritage and published in 1994, when the docks had reached the end of their useful life, can be viewed on British History online and it shows the vast scale of the eventual project. 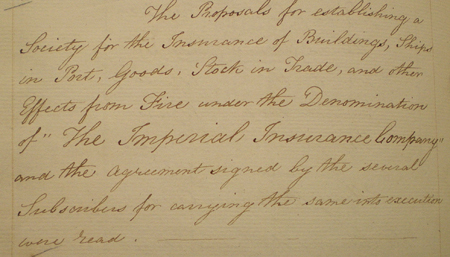 One spin-off of the West India Dock Company was the founding of the Imperial Insurance Company, ever mindful of the risk of fire. Little now remains of this huge and wonderful feat of civil engineering and mercantile ambition – replaced by London’s Docklands offices and tower blocks, the symbol of a different age of ambition. 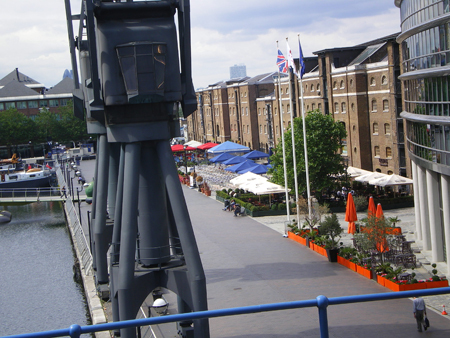 Its history is preserved in the Docklands Museum, housed in these few remaining buildings. What a fascinating post! I knew fires were a constant problem but had no idea they could be so widespread or disastrous on such a scale. I really enjoyed reading this. Thanks Frances, I think fire was a constant danger which we underestimate today as they rarely get out of hand in cities now. It would be interesting to know if anyone has done a study on how often large parts of towns and cities were completely destroyed by fire over the last, say, 700 years. This reminds me of why I could not think of living in a city! 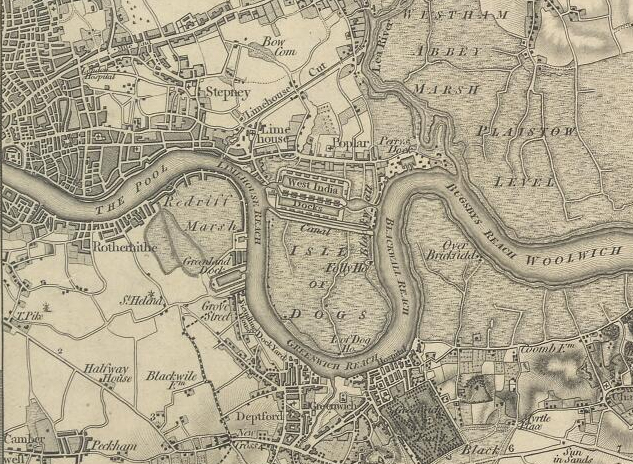 Anne, do you have any information on the ‘Isle of Dogs’ that I see on the map just below West India Docks? Just curious. I think the Isle of Dogs, which was largely empty land until the docks were built, was where the royal hunting dogs were kept. However if you look on Wikipedia you will see there are several possible explanations for the name. Has anyone any information of John Inglis,Chairman of the London Docks prior to becoming a Director of the East India Company around 1803? Or does anyone have information about any online sources re Dockland records? I don’t think any of it is available online, but I’m sure you could contact them for help. East India Company records are held at the British Library in London – not really anything much online that I’m aware of apart ffrom some Indian BMD records which you can search at http://indiafamily.bl.uk/UI/Home.aspx. If I come across anything about John Inglis I’ll let you know. Also very sadly he seems to have shot himself in 1822 ‘being in a state of insanity’ (New Monthly Magazine 1822 – Google Books). You may already have found these.